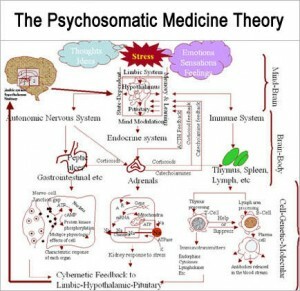 Psychosomatic medicine focuses on the interactions between mind and body and the powerful ways in which emotional, mental, social and spiritual factors can directly affect health. Psychosomatic medicine focuses on the study and treatment of those emotional disturbances that are manifested as physical disorders. The term psychosomatic emphasizes essential unity of the psyche and the soma, a combination rooted in ancient Greek medicine. Common disorders caused at least partly by psychological factors include childhood asthma, certain gastrointestinal problems, hypertension, endocrine disturbances, diabetes, and possibly even heart disease. Clinical situations where mental processes act as a major factor affecting medical outcomes. The patients who have a psychiatric problem that is a direct result of a medical illness or its treatment, such as having depression due to cancer and its treatment. Somatoform disorders. Somatoform disorders are psychiatric disorders that are displayed through physical problems. In other words, the physical symptoms people experience are related to psychological factors rather than a medical cause. Psychosomatic medicine and Psychotherapy is an exciting and new growing medical specialty with a fast and constant evolution. It offers a new point of view regarding the correlation between physical and (somatic) illness and psychiatric factors that create somatic illnesses without physical substance. An interesting aspect is the fact that a psychosomatic medicine and Psychotherapy practitioner has the opportunity to conduct psychiatric evaluations and treatments for mentally healthy individuals without having to interact with common psychiatric patients. In Germany psychosomatic primary care is compulsory part of training in all specialties. All practicing physicians need to complete an 80-hour course of basic psychosomatic care (psychosocial diagnostic interview, psychotherapeutic interventions, and relaxation techniques). The most common training method in psychosomatic medicine is based on the Balint groups method, in which a group of doctors, therapists and Psychologists consult with each other regarding the treatments of the patients and the treatment relationships.